For the very best remote viewing news, examples, theories, articles and much much more there is eight martinis. 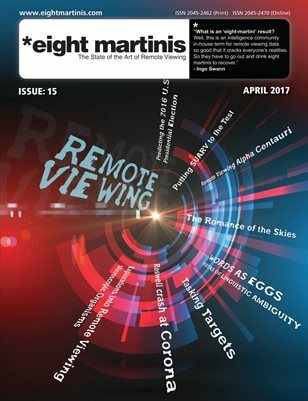 eight martinis remoet viewing magazine is FREE to download and can also be ordered as full colour printed editions for you to keep forever. Each is packed with articles and examples from the key players within the field of remote viewing. Step out of the Box: A Time-Sensitive, Front Loaded Case Study. by Angela Thompson Smith Ph.D.
Daz Smith’s suggested reading – Remote viewing books this winter.